For this special occasion I'm giving away 10 books that I made, that I affectionately call "PaigeBooks"! Each book is unique and beautiful and handmade from scratch by yours truly. It would mean the world to me if all ya'll (whether I know you or not, I promise I don't bite :) would take a gander, pick your top three favorites, and talk to me in a comment on this post for a chance to win one! Just a wee bit about these books as a whole: They're all coptic bindings so you can see the thread and how they're sewn together on the spine. 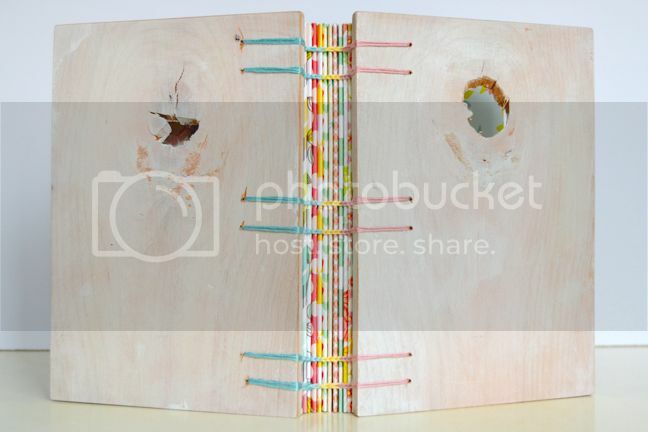 It's my favorite style of binding, no glue is involved (unless you need it for the cover material), it looks neat, the books lay flat so you can easily write or make art in them, and the cover possibilities are endless because if you can drill holes through it, it can be used as a cover. 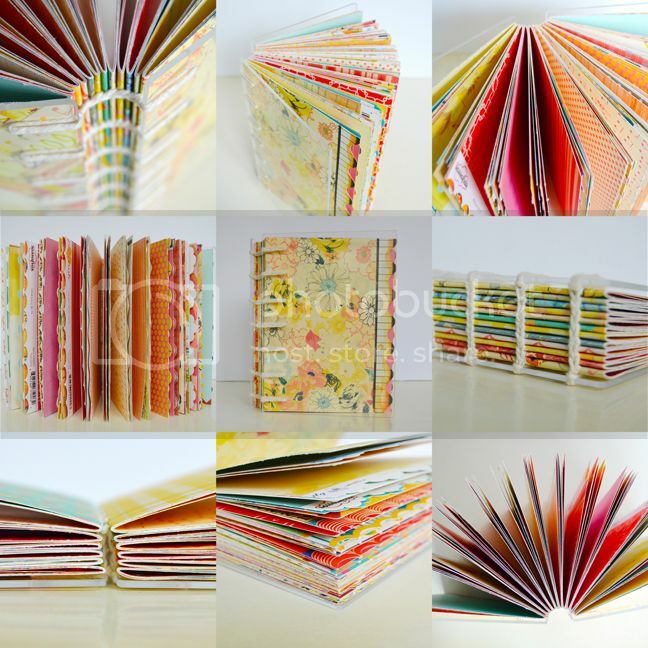 Most of the pages are made with printer paper, cardstock, and/or scrapbooking papers. Let's begin the show and tell! Unique features: I bought these coasters from Anthropologie specifically to make a book. That was about four years ago. Finally found a good excuse to use them! 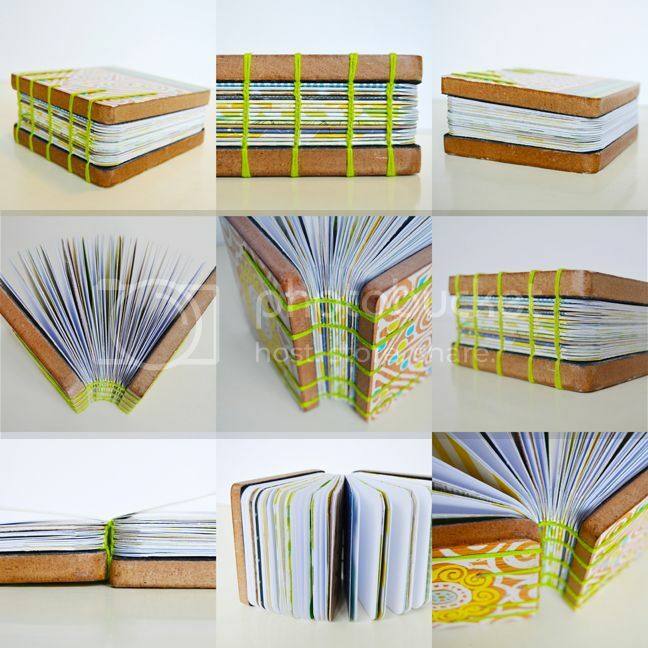 The white printer paper pages are wrapped with decorative scrapbooking pages that match the colors of the coasters and it's stitched together with lime green floss. I also rounded all the corners of the pages to match the rounded coaster corners. Unique features: The rounded edge makes this book special! I made a rounded book very similar to this for my 1000th post giveaway and thought I'd give it another go this time. The pages are made from an eclectic mix of media - felt, glitter paper, cardstock, vellum, printer paper, etc. This would make a great wedding sign-in book, baby shower book, baby book, journal, art book, smash book, etc. Unique features: The covers are made from one of Fox and Jane's old board books that got destroyed but I rescued the nice and thick pages to use for PaigeBooks. I have a bunch of floral fabrics so I chose a couple I liked and wrapped them around the covers. That makes it sound so easy, but really a lot of measuring and glue is involved! I used two colors of baker's twine to sew - pink for the first half and blue for the second half. Note to self: Don't put the binding holes closer than 3/4" apart. It was super hard to sew this binding, I nearly lost my religion haha. Just kidding. But it was definitely the hardest book to make. Good thing it's pretty :) The pages are made entirely of printer paper so the possibilities for book uses are endless. Unique features: The covers are made from my favorite material: wood. 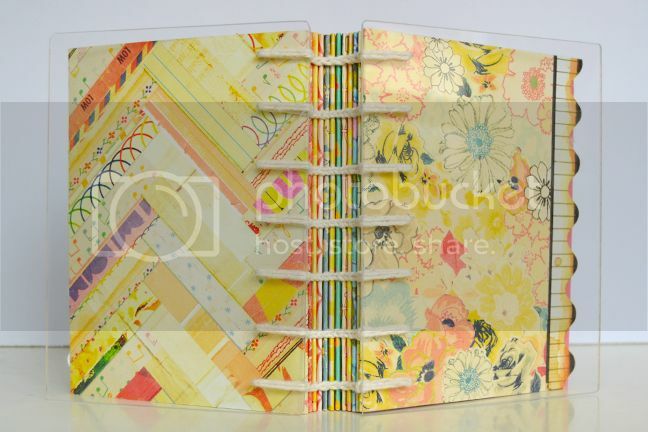 The pages are printer paper wrapped with scrapbook patterned papers from the Soho Garden collection by American Crafts. The sewing a little unique in the design and they're placed closer together than "usual" for my books. For a final bit of funky flair I attached a knob to the front for easy opening! The rainbow colors of this book make me happy. Unique features: On Wednesday I drove 20 minutes to an antique shop in Weiden and found piles and piles of books. A few caught my eye for the purpose of reconstructing into books - this one made the cut! I did a little googling for the title and it translates to "Home in the Forest". I love the watercolor images on the covers and how German the scenes are. Reminds me of our home here. The pages are blank printer paper. As a fun touch I strung bits and baubles of this and that into the spine. Definitely one of my favorites! Unique features: The covers are made of a license plate! From our old car no less. 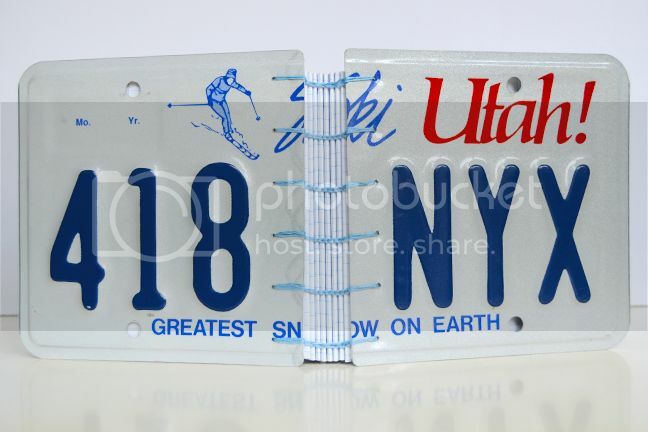 I love skiing, I love Utah, therefore this book is awesome :) I used a friend's pair of metal clippers to trim the plate in half and then an awl and hammer to make the holes. Had to pull out all the industrial tools for this one! The pages are made from grid paper so it'd be good for math and sketches and stuff like that. Be careful when handling - I tried to sand down the edges but they're still a bit sharp! 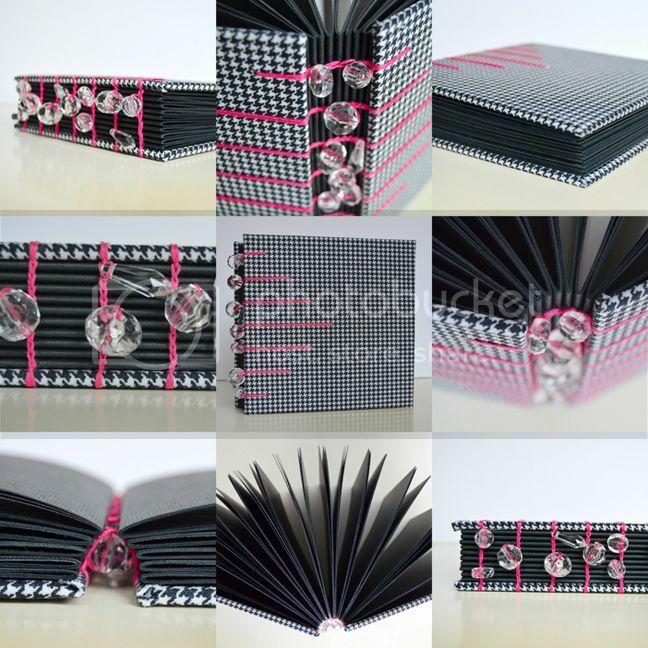 Unique features: I wrapped boards with houndstooth fabric and the pages are made from black cardstock - fun for white markers and other specialty pens meant for dark paper. Then I went the Victoria's Secret route and opted for hot pink thread for the binding. And some bling, woot woot! Perfect for a tween girl or teenager or bachelorette party. Unique features: I love these natural holes in the wood covers which I then whitewhashed with paint. The printer paper pages are wrapped with an assortment of Dear Lizzy patterned papers. I used THREE colors of thread to stitch the binding! Never done that before! Unique features: Cassettes? What are cassettes? Haha. What a different world we live in than just 20 years ago. Hey, there are holes already in 'em so they make perfect book covers! I got these cassettes from Desert Industries like a decade ago. I have a whole bin full of miscellaneous items I want to turn into books. For a touch of sparkle and shine I stitched the book together with gold thread. The pages are made from lined paper so you can write straight in it. Unique features: Saved my favorite for last :) This book has covers made from Plexiglas - a fun material because it's see-through! All of the pages are made from Sassafras Lass patterned papers (I wish they were still around - their patterns are so unique!) 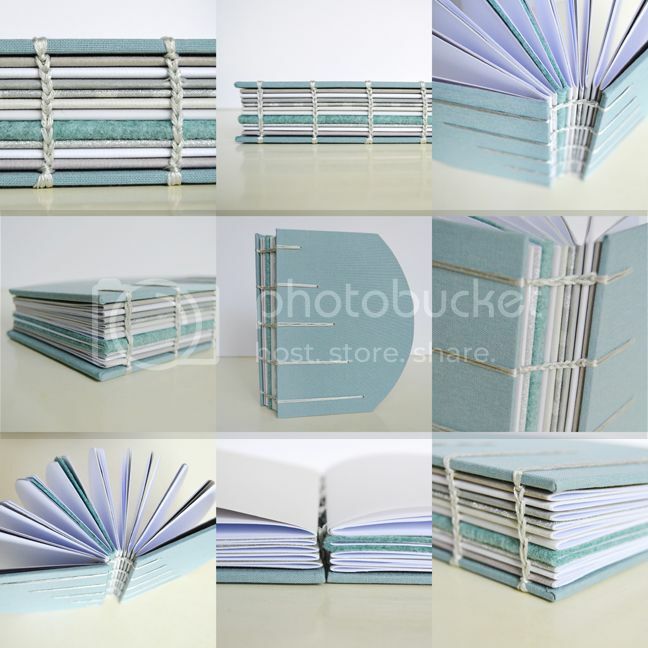 and another special feature is each page has a decorative edge. I stitched the book together with yarn so it's thicker. I just love the patterns and colors of this book. Not ideal for writing in but perfect for pictures and ephemera and such. To enter to win one of these PaigeBooks, leave a comment on this post by Monday December 1st 2014 and tell me two things: 1) Which three books are your top favorite so if you win I can make sure to send you one you love, and 2) Tell me how you know me! That's my favorite thing - to find out where the people who read this blog came from. Easy as pie! I'll post the 10 randomly selected winners on Monday December 1st. THANK YOU THANK YOU for your readership and helping me reach 2000 blog posts! I love your wooden books, the three of them (in no particular order) are my favourite. Thanks for the chance to win, and for such a great blog. I love how you combine travel, family and scrapbooking in one place. I am from NZ, but first started reading your blog in 2012 when we lived in the UK. I "found" your blog via two peas, you were my favourite Garden Girl. Gratulations and thank you Paige for being such an passionate and gorgeous Blogger, I so enjoy to read your blogposts! I first stumbled across your blog about the time you were pregnant with Fox, so it's been quite a while I guess :-) I followed your journey since then and it kind of makes me happy to see how you enjoy living in Bavaria, which is my home as well! Choosing one or three of your books isn't too easy, they're all so so beautiful and I would be honored to get one of them. Since I have to make a decision I especially love the round book, the book with the floral design and the one with the whitewashed wooden board. congratulations, Paige! I first started reading your blog when you become a Garden Girl. I love to read about your travels, I do also live in Germany but have not see so much as you guys. Woohoo!! Congratulations! To be honest, I can't exactly remember when or how I started following you, but definitely before Fox was born! Gosh! Top 3 picks: Floral fabric, Rounded book, and the "Open" knob book. Here's to another 2000 posts!!! I came to your blog through 2Peas. I love your boy's layout as I have a son myself and needed inspiration for churning out male theme scrapbook. I find that you layout is do-able for beginner scrapbooker like me. Thank you for the chance to win the fab note book. My favourite books are the Plexiglas Sassafras Book, the Rounded Book, and the Floral Fabric Book. All the best for your future thousands of posts :-) I look forward to the frequent inspiration. Ohh WOW ...I just FOUND your Blog today perfect timing ;-) my top three on the very very top the Utah one I love to ski and hope to someday ski in Utah !! The next would be the German on and then the wooden one . Totally entering this!!! You are SO talented. I, personally, love the casette book, rounded book, and vintage german charm book! But they are all amazing. Kind of hard to pick! 2000th post!! wow--what an accomplishment!!! Congrats!!! You don't know me! I have been a reader for a couple years! I am the crazy girl who yelled out your name in the seatac airport 2 Christmases ago- before even thinking- "paige doesn't even know me! This is going to be weird"
Congrats on your 2000 post! I love reading about all your travels in Europe! Congrats with the 2000th post!!! I learned about you from instagram when I started scrapbooking/journaling/PL/filofaxing. I found your blog through American Crafts' blog. I really love your creations and your blog. So inspiring. 1. Wood with "open" knob. I love 3,4&8! Your books are all so creatively done but 348 are my faves! I think I got to know you through instagram. Your instagram was recommended by my pal for scrapbooking inspiration as I have materials but I seldom make use of them. I got mental blocks when it comes to scrapbooking..
Ove 4 and 6. All the books are unique and nice. Hope I can win one of them. I get to know u from Instagram and also from studio calico IG. Love all yr layouts. What a fabulous blog! Love your books, what don't you do? I follow you on Studio Calico. Hard to choose a book but my favorite has to be vintage German <3. Next is the little black book and I like the floral fabric too. Truly I would be honored to win any of them. So much love goes into making each one, how can you part? Thank you and congratulations for your commitment to posting for 6 1/2 years! I love all of these, but my favourites are 1, 4 and 6. I love the door knob and colours on no 4 and my son who is 2 loves reading number plates (weird hobby I know!) but he runs to every car he sees to read the number plate! So that one would have to be a favourite for that reason. You are so talented. I also have a 2 and 4 year old! I found you through SC. I love your layouts, my favourite that I've copied is the rolled paper technique and I've also taken your stitched class which I'm doing right now, it's amazing! Thanks so much & Congratulations!! 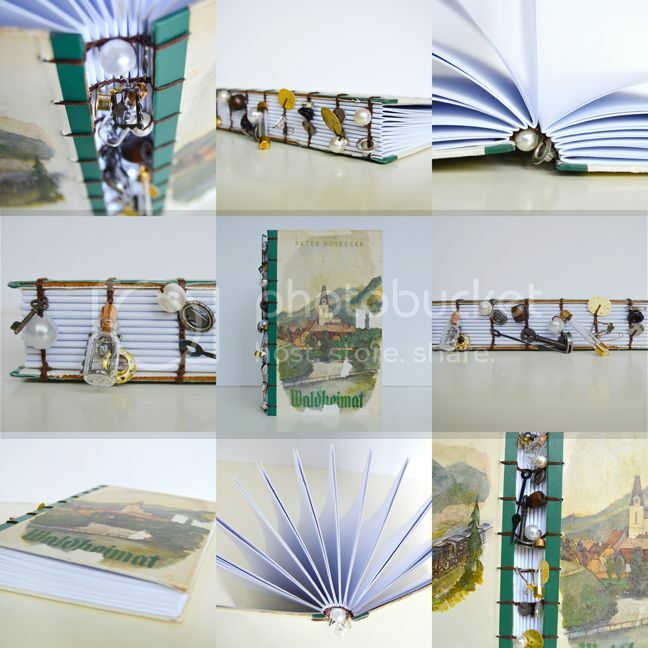 I love The open knob wood book, the white washed wood book & the vintage German charm book. So creative! I love all your work, such great detail. I found you via a friend on Instagram & have been reading ever since!! Thank you! Love all of them but my fave 3 have got to be the wood with door knob, the whitewashed wood and the cassette one! So cute, would love one to call my own. Congrats on your 2000th post!!! Awesome books!! My favorites are the white washed wood and the wooden one with the open door knob! They both are adorable. I first found you from two peas in a bucket you tube videos. Thanks for the chance to win. Obviously these books are amazing. The time you put into them shows with how beautifully they are put together. I'm in love with the fabric flowers, the little black book and of course the plexiglass book. Such talent. I follow you on Instagram and didn't know you had a blog till now. Love them all. Congratulations!!! All the books are soooo lovely!!!! 5 and 8 really caught my eyes!! Congrats Paige, on your 2000 blog posts!! I re-found you on Istagram, not too long ago. The photo of your mailman with your Studio Calico package.... priceless! Back in the days when I was scrapbooking a lot, I also read your blog, via 2peas. Really enjoy your Instagram photo's and blogposts. Your work is beautiful! Thank you for this chance to win one of your books. I love plexiglas sassafras book, little black book (just my daughther's style) and the license plate book. But they all are awesome! Wow Paige, these books are so lovely, they make me happy seeing all the pretty colors!! Here are my favorites, in order: 10, 4, 1. I don't recall how I found your blog, but it was likely either from American Crafts or 2Peas a few years ago. Thanks for the chance and congrats on 2000 posts!! Wow!! 2000 posts!! That's awesome!! You're books are amazing and my favorites are the rounded book, the license plate book and the whitewashed wood book. But the seriously they are all so pretty that it was really hard to choose. I'm from Spain and I know you because of Instagram!! I'm one of your followers there! I know you since you liked one of my pics on Instagram. And we met physically on your workshop at Scrapbook Werkstatt in September. It isn't easy to make a hitlist of your books, but the following ones I like the most: the one with the license plate, the wooden one with the opening knob and the little black book. I hope, we will meet again some day! Congrats to the 2000 posts. That's a lot of work. And I know you from CAR in Germany, and your amazing workshop there. WOWERS can I say these books are INSANE!!! WOWERS..OK now that my jaw is off the floor for the moment I love Wood with Open Knob,Little Black Book and the White Washed book.. WOW...just WOW! Now how do I know you besides being one of my favorite scrapbookers I've had the awesome pleasure of purchasing these sweet Pacifier clips and you even was kind enough to do a giveaway with me. You ROCK girl!! I loved all. But i perfer 3, 5 and10. I follow you at IG. I am brasilian and i am not good in enghish.... Amo seu estilo de encadernação. São únicos. Seria um prazer usar um dos seus paigebooks. Parabéns. Thanks. I love them all! You are so talented and creative. My favorite is #8, and #3 & #4 are my second and third favorites. I think I found your blog through an IG post and thought your photos were so lovely. I enjoy reading your stories. 💖 Congrats on your 2000th post! My favourite 3 books (in no particular order) are the plexiglass, licence plate and black & white. But seriously, they're all amazing!! As are you for doing this! Paige I sense that your soul is filled with beauty and love as is your personality and all reflected in the LO's you make and now in these precious books. I love #8 #9 #10. Why? I think they reflect your love for beautiful papers and fun, unique designs. If I won the cassette book I would gift it to my 8 yr old grandson who has a little diary that he writes in and loves to make cards. I love the Anthro Coastes Book, Little Black Book and White Washed Wood Book. Just to follow instructions because all of them are wonderful. I came to know you on instagram via Heather Leopard. I kept seeing gorgeous patterned paper filled layouts and drooling! I love that you are so inventive with your book covers - cassettes rock! My favourites are number 2 with the beautiful elegant curve; number 8 with the holey wood that looks like a bird box; and number 10 with all the awesome colourfulness! Congratulations Page! And thank you for this awesome giveaway! And how do I know you? I think the first time I heard about you was on some blog - i don't remember which one - where you were guest designing (and I remember making a stupid comment, saying that you reminds me of demi lovato, haha). My favorites are the whitewashed wood book, the plexiglass book, and the rounded book. They're all very neat though! I think I came across your blog just looking at other crafters' blogs, and really liked your style! Congratulations for this milestone! I'm sure it feels amazing. My top 3 are: Wood with "open" knob (by far the best - so adorable), whitewashed wood and the floral one. And I first spotted you on 2peas and I absolutely love your scrapbooking style. Your work is GORGEOUS! I can't believe that those books were handmade! I found you on Instagram. I think you must have like something someone else did, and when I saw your comment, I went in to check out your work. I love your creativity. Congratulations on 2,000 blog posts. I'm sure the blog, as well as a lot of your work is a labor of love. It seems like it would take forever to make some of the things you create. Thank you so much for the chance to win. That is so generous of you! Best wishes for 2,000 more blog posts. These books are amazing! I am from North Carolina and I found you through Two Peas after Fox was born and I was instantly in love with your scrapbooking style. You are my absolute favorite scrapbooker! I have loved following the journey your family has taken over the years with your children being born and moving overseas. My favorite books are 2 (Rounded book), 4 (Wood with open knob), and 8 (Whitewashed book). Thanks for giving us the opportunity to win one of these awesome books! Paige you are so insanely talented. I have been reading your blog for years and following you. I think I first started following you through Two Peas, but even more so since you joined the Studio Calico team. All of your books are gorgeous. IF I had to pick, I like the Antro one the best, followed by the one with the rounded corners. Honestly though they are all just so darn fabulous, it was really hard to pick. Congrats on your tremendous 20,000th post! That is quite the accomplishment. Oh - they are beautiful! My 3 favs: floral fabric, plexiglass and little black book. I know you from Studio Calico - where I follow you. Happy 2000th blogiversary!!! Congratulations on 2000 blog posts! That's amazing!! I love your paige books and I would love a chance to win one!! I personally love the cassette tape one, the plexiglass one and your one with a knob! - They are all amazing though so any would be an honor to have one! I found you in the two peas in a bucket gallery and fell in love with your work!! You're so talented, can't wait to see what comes in the next 2,000 posts!! I found you through a hashtag on instagram for something related to grafenwoehr. I started stalking you before we even met! What a creep. Lol And now we know each other. Yay! Im in love with all of those. I want to be you when I grow up lol. But i love the knobbed book and the wooden ones and also the plexiglass one. Thanks for sharing you with us! Amazing work; just amazing! I love the Sassafras, white washed and wooden books. I saw your post on IG. Congratulations on your blog! But I must say that cleverness of the cassette tape caught my eye on your IG post! If only it was my NKOTB tapes! I found you through Leslie Ashe a few years ago. It was right after you found out you were pregnant with Jane. I have enjoyed following your adventures :) And I have designed a few quilts inspired by your layouts! I like the Wood With Open Knob, The Round Book, and the German Charm Book. I recently started following you on Instagram. SASSAFRASS, SASSAFRASS, SASSAFRASS in that exact order ;) I'm a SUCKER for books with different patterns for every page! I also adore the Whitewashed Wood book and the Little Black Book. I found you via American Crafts blog (I think?) and have been reading along. I LOVE your travel posts. Paige, you are insanely talented and I want to thank you for sharing that with the world. Congratulations on your 2000th post. Yah!!! I like the vintage German book as well as the wood "open" book and the white wash wood book. The vintage German one reminds me of all of your fun European adventures you are getting to experience. The wood books seem like something you would only be able to find in quaint European villages. Congratulations and I look forward to more inspiration from you as well as posts on your adventures. I love the anthro coasters book, the vintage German charm book, and the license plate book are all great! Paige - Congratulations on you 2000th post, what an amazing milestone! I have enjoyed following you journey for almost two years and love reading about your travels, everyday life and crafty wisdom! You are an amazing craft and artist! Thank you for this amazing giveaway, each one looks amazing and lots of love put forth to complete them. My favorites are: Wood with Open Knob, Rounded Book, and Plexiglas Sassafras Book. Looking forward to another 2000 plus post! Best wishes and best of luck on this amazing journey in bloggerville!! Wow! Beautiful work! My top 3 would be Fabric, plexiglass, and wood with open knob. I just recently started following you on instagram. Hi Paige! Congratulations! Your books are all amazing-are you going to post a tutorial? I particularly love the wood with knob, the white washed wood and the german vintage book. Thank you so much for this giveaway and for your monthly inspiration at SC! I am so impressed with your creativity and skill level. These books look beautifully done. I love the blue Rounded Book and the Plexiglass one, but my favourite is the Wood Book with the "open" knob! Thanks for your generosity! They are all GORGEOUS, but 4, 5, and 8 are my faves. You are so talented and so extremely generous for giving away your hard work! I have been following you on IG for about 3 months. I am not exactly sure how I came across your page, but I am glad I did! Sorry..I forgot to add how I got to your blog. I've been reading for years, but am not sure where or when I started. Probably a link to one of your layouts, Studio Calico maybe? I come to your blog to see your beautiful amazing scrapbook layouts!! I love the anthro coasters book, the wooden one with the Open knob, and the plexiglass sassafrass one the best. All are amazing! OH MY GOODNESS PAIGE! These books are sooooo cool and you are so creative! I'm so amazed by your 2000 blog post milestone - congratulations - so cool! I love all these books because they are so unique and interesting. 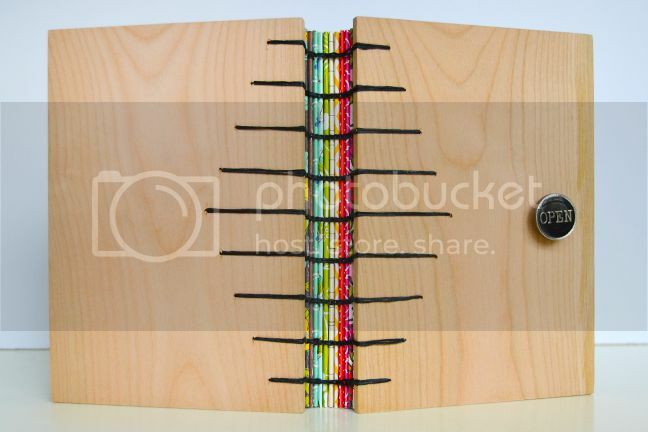 My favourites are Plexiglas Sassafras Book, Wood with 'Open' Knob, and Floral Fabric Book. I found out about you over at Studio Calico. I first saw your Birthday Girl layout (http://www.studiocalico.com/galleries/128612-birthday-girl) and I completely fell in love with your creative, colourful, happy scrapbooking style. I have been following you ever since! I follow you on SC, here, and on Pinterest. Truly Paige you are SUCH an inspiration to me! I love how patterns, colour and embellishments don't seem to scare you but instead they inspire you. I love using colour and pattern in my layouts too and I completely look up to you. 3,5,10 books are the Best! Wow! Congratulations! Your books are stunning! My absolute fave is your fave Plexiglass Sassafras! I also love the Floral Fabric and Little Black Book. I found your IG account through the Paper Issues FB group and then your blog from IG. Thanks so much for the amazing giveaway! These books are adorable. Love the wood with knob, whitewashed wood and plexiglass sassafras book best but they are all great. I've enjoyed your scrap layouts for years at 2 peas and at studio calico. Love your paper piecing with all the colors and patterns. Congrats on your 2000 post. And of course I know you from AC! Ha! I found you through scrapbooking! I think through Studio Calico. Having travelled quite a bit through Germany (my mom lived there for 10 years) and the surrounding areas, I love, love your travel posts. So many memories! My favorite books are the whitewashed wood, vintage german, and wood with open knob! 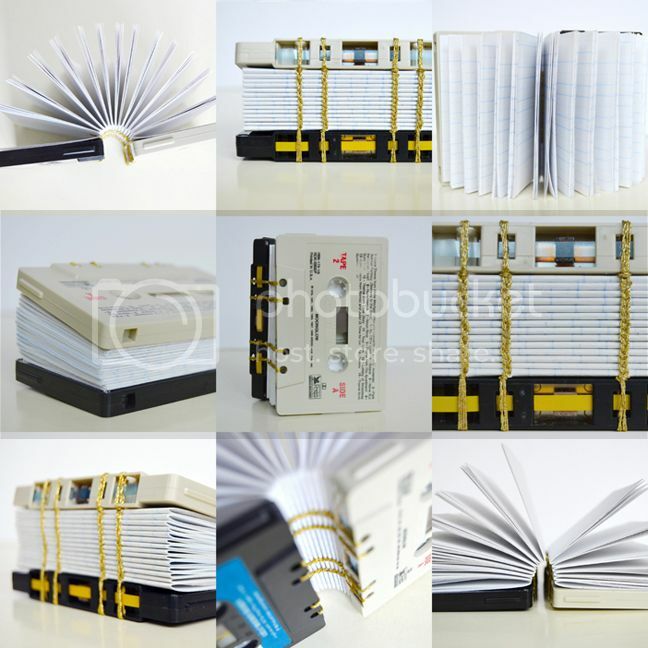 Will you please do a tutorial on how to make these books??? My fave would be no. 3! 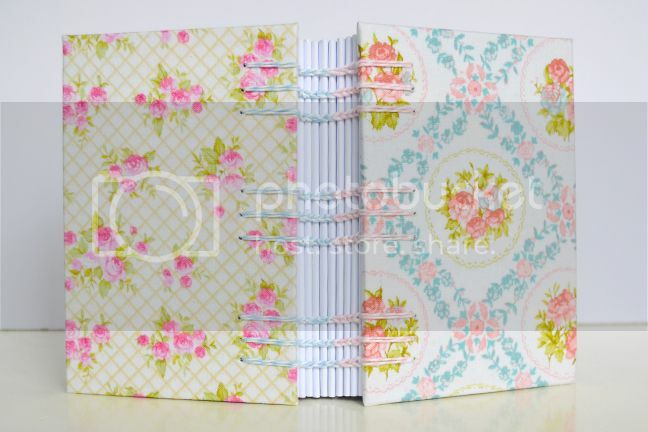 !the side binding is so nice in pastel and its floral design!! ♥ no. 10 is great too with so many designs and no. 2 is pretty COOL haha. 2) Wooden knob - it's organic and oh so pretty. I love that cute little metal knob too! 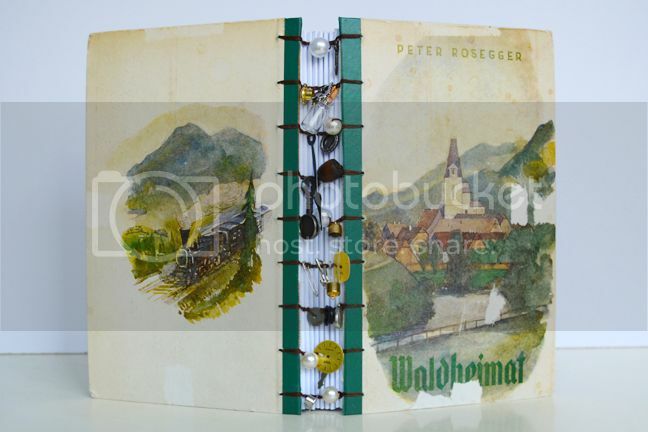 3) German charm - I hope to travel to Germany one day and this would be the perfect little book to capture all our memories. These are awesome! The two wood books are my fave (especially the one with the "open" knob), but I also love love the Vintage Charm book! It's so gorgeous! I first saw you on 2 peas. Love your work! Yay congrats!!! My top 3 are wood with open knob, the rounded book and German charm! I found you from American crafts and northridge publishings! My favorites are 3, 4 & 10. I love your blog! I found you through Two Peas (still so sad they are no longer around). Also, I live near Seattle and really enjoyed your post about Leavenworth. So jealous your family has a place close to there. Beautiful books. I wish I had the patience to do something like this. just joined Studio Calico at the end of September, and found you there! So beautiful and creative. My favorite 3 are: cassette, wood with knob, coasters. I probably found you via a "diy/crafty" blog hop giveaway thing. Congrats on 2,000!! That's quite an achievement!! Herzlichen Glueckwunsch we would say in German! I love your blog and arts, you are amazing. It's quite hard to pick out of all the lovely book's! Can't wait to see more of your lovely scrapbooking. Congratulations Paige for your 2000th post. Thank you for sharing such inspiration and for this giveaway. I came to your blog through Studio Calico. Oh how could I only pick my top 3 LOVE them all,okay here it goes:(1) Pexie Glass Sassafras book. I love the bright colors, makes me wish I horded some of their paper. I love how cheerful it is. (2) Vintage German Charm. I love this book. Everything about it make me want to jump on the train that on the back cover and go on a wonderful holiday. (3) I love the Open Knob Book, it's sooo clever, I think I'd use it at a prayer journal. Congrats on the 2000th post! I've been reading your blog for a long time - in fact, I think I came to it right before your 1000th post! Can't actually remember how I found it then. I'm from England, and live there now, but for a while, we lived in the USA (Buffalo, NY) - so I find it fascinating to see you do the opposite 'cultural exchange' to what we did - you USA to Europe, us the other way round. Really enjoy your blog - always amazes me how many photos you put in some of your travel posts - it must take forever - or you're a very fast worker! My favorites are the white washed, tape cassette and Sassafras books. Congratulations! I remember you from the days when you were with Scrapbook Trends. It was always thrilling to get an email from you requesting a layout! My favorite books are the anthro coasters, the plexi Sassafras and the open door album. Wow, Paige! 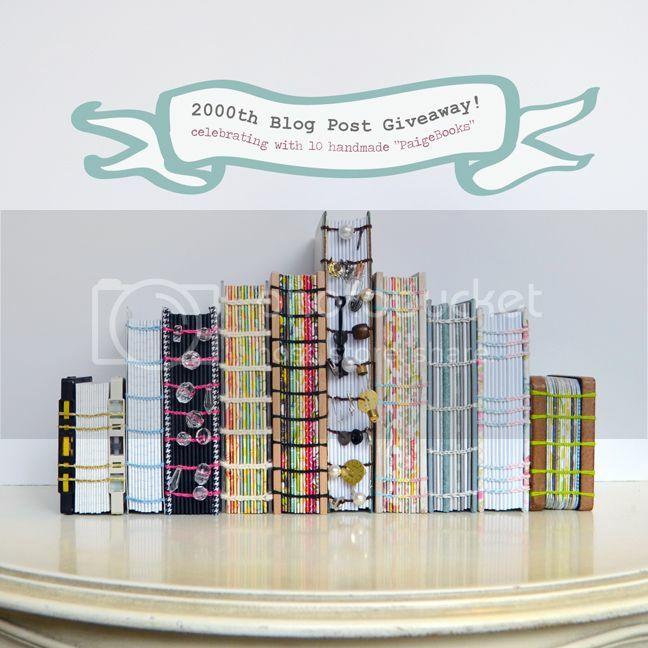 Congrats on the 2000th post and those books are amaze-balls!! Seriously, you are so talented. My 3 favorites are the wooden one with the door knob, the Sassafras plexiglass one and the floral fabric book. Just adorable. I first got to "know" you on Two Peas - your videos were standouts because of your patterned paper use but I didn't discover your blog (or the other GG's) until Two Peas closed down. Thanks for the chance to win! All of them are so beautiful!!! My favorite is the Open Door. I have been a fan of yours for so long. I am a quilter, so when I see your pages it is comforting like a quilt!! Congrats on your 2,000th post! I love the wooden one with the knob! Also the cassette and coaster books.. brilliant stuff!! Ibecame a fan of you when I found you on instagram.. congrats on a fabulous blog! your books are gorgeous and it took a long time to decide, but I did it! 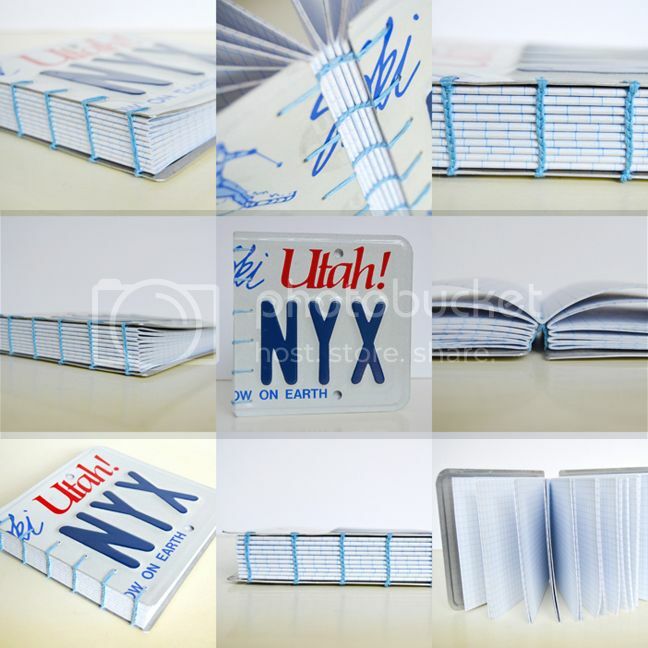 :) My favourite 3 books are the Plexiglas Sassafras book, the license plate book and the anthro coaster book :)! We met at your minialbum Workshop at scrapbookwerkstatt, I went there with my big sis! I hope we're going to meet one day again! OMG these books are divine!!! you need to do a class showing us how to bind like this, I love doing minis and would love to add this style to my collection. My faves have to be books 1,3 and 10 with 1 being my favourite. congrats on your 2000 post!!! that rocks girl!!! all your books are soooo dang amazing!!!!! I know you from scrapbooking and reading your blog for maybe like 4 or more years, you were in utah when I started reading. LOVE #10 (I still wish sassafras would come back) #8,#4.. but really they all rock!!!! keep up the amazing posts on your blog!! Paige you are so awesome! I love your Paigebooks, they're so unique and awesome. I've been following (stalking) your blog for years. You were the first blog I followed and then I fell deep into the creative blog world. I think I found you at 2 peas, i honestly dont' remember but you've wowed me with your creativity ever since. Then I took a class with you once, at Create by the Beach or something, i don't know but you are my favorite because you actually taught us technique and didn't just give us a kit, you went through each step and I went home feeling accomplished. I love your stuff and your bits of family life. Thanks for giving away stuff, my fave is winning, lol. wow! I love all of them, but my top three are 4, 8, and 10. Congrats on 2000 posts! Can't wait to see what you have in the next few years! And the whitewashed wood book. I first saw and loved your work on Two peas and was thrilled when you started working with studio calico! The books are too cute. I love 1, 4 & 7. I never would have thought of black paper. I found your blog shortly before you moved to Germany. I've really enjoyed hearing all about the move and your trips around Germany and all over. Not sure how I found you, just glad I did. What a fantastic milestone and an equally cool giveaway! I think the books are all adorable! What a creative mind! I love the Cassette book, the Vintage German book and the Rounded book! (in no particular order)! I fell in love with your work on Two Peas! YOUR work is outstanding and I am a huge fan!!! Ich würde mich so sehr freuen, wenn ich Nr. 1, 3 oder 10 bekommen würde! I "know" you from SC messages boards although I'm actually really new to them too. Love your blog, it's amazing! Hi! Love the coaster one, wooden open book and black and pink. Congratluations! I like your books and your layouts too. And your mini books are lovely. My favorite books are no. 4, 7 & 8. And so are your PaigeBooks - it's hard to pick favourites but the Sassafrass book must be my top pick. Definitively. And then I think the Whitewashed book and the Floral Fabric book come next. Congratulations to 2000! That is some dedication to blogging. I believe I first "met" you on your "One Amazing Album" feature in Scrapbook Trends. My fave is 10 but like them all. 2 and 3 would be my next picks. I started following either through Studio Calico, 2peas, or maybe the magazine you worked for. I am not sure as it has been several years. I enjoy all your travels now so still a good fit. Congratulations on 2000! Just amazing, is all I can say. I found you years ago in "print" magazines which I still have. There is nothing like a good hard copy to revisit often. I felt like I hit pay dirt when I found your blog. Thank you for all the inspiration over the years. Thank you for the chance to win one of your lovely books! My choices would be #5 (as we did a bike trip on the Romantic Road in Germany with our nephew and girlfriend in June-love the bling you added to the spine! ); #10 as it is your favorite and great memento of you; and #1 as Anthropologie is my favorite store with their colors & designs. I think I found you via Two Peas. I love all the different ways you use paper. I love the Plexiglass Sassafras book the best but the Little Black Book is gorgeous and the Whitewashed Wood book are really just as amazing! I hope you blog for another 2000+ posts! Congrats on reaching this amazing milestone! I found you via the American Crafts blog! My favorites are 10, 8, and 9! I found your blog via Amy Tan's Blog a few years ago! I bought one of your great moving purge boxes and I am still using items from it! I adore your scrappy style and these books of yours. I think my top three are 4, 7, and 10! Happy blogging! 3, 4, and 10 are my favorites but holy cow they are all so amazing!!! you are so insanely talented that i really do marvel that i know you in the flesh! i know you through our chrises (this that the plural of chris?!) and loved that i sat right in front of you on one of the flights back from our honeymoons! i love your blog and your posts! and thanks so much for your congratulations! This is such a generous offer and all your books are amazing, I am just blown away! I'm a scrapbooker and I started taking notice of your work everywhere - you have such a unique and amazing talent for paper piecing that it's easy to pick your layouts from anyone else's! I was so excited when you became part of the SC creative team and pull so much inspiration from your work! Thank you for all your blog posts too!! These are gorgeous! My faves are the Open one, the vintage german book/charms, and the whitewashed wood. I've been following for a while now, but I think I first found you through the Create blog. Congrats on this big milestone!!! I found your blog through Studio Calico. I love 4, 8, and 10! Congrats on 2000 posts...love all your stuff! Yay! Yay! Yay! These were all amazing. I love the plexiglass, white-washed wood and the vintage book cover. Seriously, I cannot express how awesome these are. You are so talented! I wish we could have gotten to know each other better in So. Pas. Besides both being from WA, I think we have a lot in common! Oh my gosh these are so cool-- I've seen them on your site before and loved how unique they are. I love all of them but I think my favs are the wood with the knob, the cassette, and the vintage German charm. You are so talented! I started following you on SC and love all your layouts especially the halloween pages. You are so talented! I love all of your books! My 3 fav are the fabric floral one, the anthro coaster one and the plexiglass one. Of course, anyone would be lucky to win any of them! I think at one point years ago I blog stalked you from the rappleys blog ( I was friends with Sharice Miller growing up), I fell in love with your craftiness and cute family and have loved following your families adventures! It's so hard to just choose 3, they are all fab. It would have to be the floral book, the German book and the license plate book. We've never met but I found your blog a few years ago and loved your posts about Disney. I've been reading ever since. A huge congrats! They are gorgeous Paige! I've read your blog years ago, I think it may be from AC? Would love to meet you IRL one day & scrap the day away! I love your traveling posts too! And yes, we've never been so I do share w/my girls! Hi Paige, I like the round one, and the coaster book, and the tallest one. (can't remember what you called it). I found you thru another blog. Can't remember which one. Yes... my rememberer is broken. Lol Thanks for the chance to win a Paige original. These are awesome! 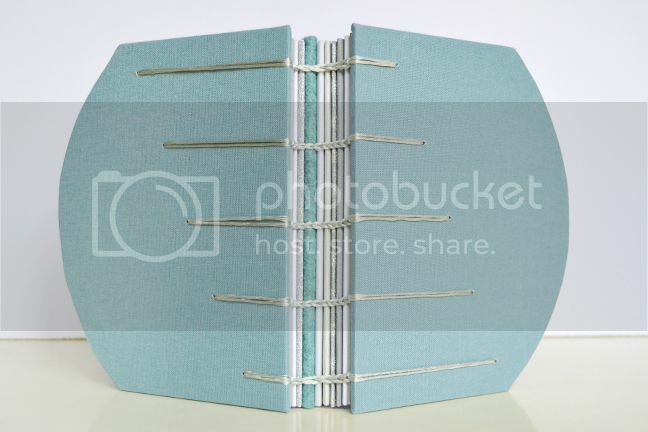 Isn't it great that BYU has a bookbinding class? My favorites are 10, 1, and 4. I love the floral fabric, white washed wood, and plexiglass ones. im not really sure how i found you, but i think it was through twopeas youtube page when i started searching for scrapbooking videos ..
Oh my love - those books are amazing! How to choose three? First of all though: Congrats on 2000 posts - that is quite an acomplishment. I love following your blog, and has for a few years after seeing your layouts on American Crafts blog. I started following you because you had a unique way of using patterned paper and colours - something I looooooooove. Very inspirational and I still think you need to come to Denmark and teach at a convention or something like that. I love your books- I'd love to win any, they are so cool. My top 3 anthro, floral and white wash wood. Hi!! I love your blog and all the pictures of your trips. Im from Mexico and enjoy a lot all your layouts! I start reading you blog about a year ago when i was looking for scrapbookers on instagram and I love how colorfull your instagram account is and from there i found you blog. You`re a wonderful person, keep up your fantastic work! Cool books! I love the Utah one of course. the last one and the pink and black one. I know you from Target, girl! :) WE both married our Missionaries! I love them all but 1, 4 and 5 are my most favorite. So creative! I have been a member of Studio Calico for a very very long time (like since the 4th kit) and started following your blog when you joined the design team. I wish I had your silhouette skills! These are awesome Paige! I think my favorite are the German one...license plate and wooden with open knob. Thanks for the chance to win! My favorite books are the Rounded one and both wood bound books. I can't remember how I ended up here, but I think several sources highlighted your work, so I had to see more. Possibilities - Studio Calico, Two Peas, Shimelle, Paperclipping Roundtable. So grateful for your beautiful and inspring work - especially with paper. I love them all, but the favorites are 1,2 and 7. The first time I "discovered" you was through studio calico's instagram. They had reposted one of your LO's and I was so impressed. Then I had to click on you're name and I was sold, I love all you're LOs. They are so amazing! Those books are all AMAZING!!! I love the wooden knob, the floral fabric, and the Sassafrass one. Congratulations on your 2000th post!! What an amazing accomplishment! I've loved your work for years, although, most recently we met through American Crafts. These are so freaking awesome Paige!! I love the Rounded Book, the Wood Book with the Open Knob, and the White-washed Wood Book. And I know you from following your awesome layouts from forever ago, and working with you on American Crafts!! 😊 Thanks for the awesome giveaway!! You seriously blow me away with your talent. And patience. Holy cow. Amazing! My top 3 books are the #5 Vintage German Charm (love love! ), #3 Floral Fabric, and $8 Whitewashed Wood. But seriously, these are all just gorgeous. My favorite are 10, 8 and 3. I personally don't know you; however, I am sure we have mutual friends--same age, but I grew up in bothell. I first contacted you about making a book after your 1000 post, but I don't know where that went... Anyways, I have followed your blog since and love to read all about your travels. I makes me want my husband to take an assignment overseas. Tank you so much for the giveaway and congrats! My top favorites are 2, 4 and 8. I am friends with Marissa P.
LOVE these!!!! top 3? 4, 5, & 10! So pretty and fun. Your books are amazing!! I love them all but 4,5 and 7 are my favourites. I love the idea of a door on the book. So fun. One of my best friends said I had to read your blog and I was hooked the first time. Congrats on your 2000th post! I love reading your blog for all the travel, scrapping and kid stuff. I don't know you in person but I have been reading your blog since you were in Pasadena (I found you from the American Crafts blog and so happy I did!) My 3 favorite books are the vintage german charm, the little black book and the anthro coaster book. I love the coaster, whie washed book and the yellow book! I first saw you in Scrapbook Trends. I picked the magazine up at my LSS. It was a layout that you created with Hambly and I was in awe. After that, I started buying ST at my store. Oh wow, Paige, your books are amazing, totally in love with them! I found your blog half a year ago at Studio Calico and I love reading about your trips across Europe and your life in Germany. It is so fun and interesting to see - especially all the things I grew up with and that are normal for me - with your eyes. So I keep following you and all your nice posts and inspirations! Keep having fun on blogging! I found your blog via 2Peas. I love reading your posts. They are so real and down to earth. I especially love the travel ones. My husband is from Switzerland. We've been to Germany a couple of times...would LOVE to live there! I also love reading your old posts from California because I lived in Burbank for 9 years. Lately I've been reading your posts when you were working the bar mitzvahs with Amy Tan...so much fun! Congratulations! Here's to 2,000 more! I love reading about your various travels and adventures. I know you from the CARDS magazine days. Always was exciting to receive an email from you requesting a card or project. My favorite books are the ones with the wooden covers, numbers 1, 4 and 8. Thank you for the chance to win. Wow! These are gorgeous! It is hard to choose a favorite, so it was very gracious of you to ask for three! :) If I had to choose, I would say 2-Rounded Book, 5-Vintage German Charm, and 10-Plexiglass Sassafras. They all have so much character, but these ones speak to me the most. You are so amazing and talented. Thanks for sharing your work with the world. Wow!! 2000 posts. Congratulations on this milestone. I can't quite remember when I first started following you but it was probably through 2peas. I really enjoy your posts on your travels & life in Europe. Your photos are amazing. It helps me remember our recent travels into your part of the world. I also love your books & have recently been showing them to my son & his fiancé who are getting married in March. One of them would be perfect for their wedding guest book & they both love them. My favourites would be the rounded book (perfect match for their wedding colour) the floral fabric book & the coaster book although it was a tough decision 😄. Keep it going, I love your work!! They are all wonderful books but my favourites are 4, 7 & 10. I am not sure how I cam across your blog - either via Amy Tan or American Crafts. Thanks for the wonderful giveaway and all the sharing you do. I love ALL you books!!! But if I had to choose three I would pick.. the floral fabric book, the wood with open knob and the white washed wood. I can't even remember where I originally found your blog. I think maybe it was from a pin on pinterest. I have been following from as far back as when Fox was just a wee little one. Cheers to another 20,000 posts! I've followed you since the glory days at Two Peas. Whitewashed, Germany and Rounded are my faves. That is crazy, 2000th, I look at my milestone of 50 post and got all tingly. Very cool. I enjoyed all the books but my favs are anthro Coaster, The rounded and Plexiglas Sassafras. I happened to stumble onto your blog about 5-6 months ago, Not sure from where but I enjoy all the posts. Congrats on all your blogs. I think I first found you on Pinterest when I was searching scrapbooking page ideas. I noticed all the ones I liked were from you. I think from there it lead me to two peas and then studio calico. I follow you on insta and love seeing all the places you get to travel. 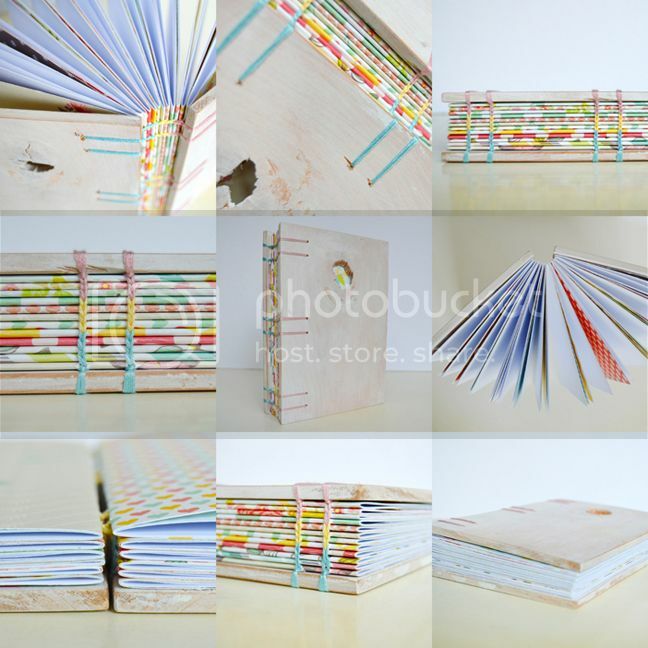 I love your whitewashed wooden book and would love a chance to win it! I look forward to all your scrapbook pages to come!! OMG! LOVE****LOVE****LOVE these!!!!! I SOOOOOOO HOPE I WIN ONE! I have followed you since the first time I saw your work. I can't even remember when its been so long. I know SC is the one that comes to mind. Your style is VERY unique and I love it. I adore the plexiglass, the whitewash wood and the floral fabric. Too die for!! TY!!! These are AMAZING. Wow. Makes me want to make my own, NOW. I found you through a friend. She told me that I had to follow this amazing scrapbooker, with adorable kids, with fantastic names. Ha! All your Paigebooks are so beautiful! 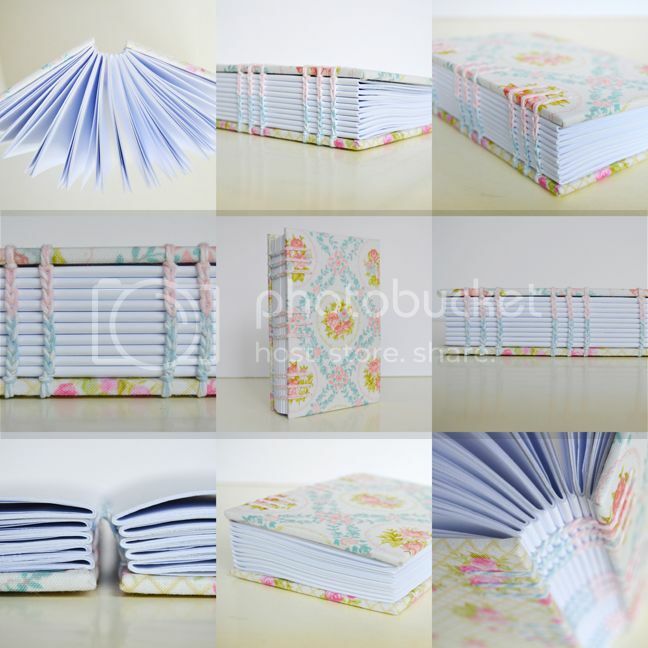 I love FLORAL FABRIC BOOK, WHITEWASHED WOOD BOOK and PLEXIGLAS SASSAFRAS BOOK. I followed you from instagram. I am @yorktee. From there, I get here to read your blog. Congratulations! Keep up your great work! You inspired me! Love them all! My favorites are the wood with the open knob, plexiglass sassafras and cassette. I found you via American Crafts. Congratulations for those 2000 posts!!! 10) PLEXIGLAS SASSAFRAS BOOK. I love it!!!! I am fron Spain and I started reading your blog 2 years ago, when you are a garden girl. I am in love with yours LO, they are a great source of inspiration to me. Congratulations on your 2000th post. Your books are gorgeous. My favourites are 10, 8 and 4 in that order. I admire your work so much - so creative and colourful -and discovered you at Studio Calico. Thanks for the opportunity to win the fab giveaways. HOLY COW THESE ARE BEAUTIFUL!! But please, DO feel free to send me any of them. Teehee. ;) I can't believe you are giving all of these away (but yay!) - I can tell how much time and love you must have put into them all. I know I found your blog through pinterest, but I can't remember what I was searching for. Glad I'm here regardless! It would be amazing to win this giveaway. I remember when I first came across your blog in 2012. I followed a link from Amy Tan's blog. Your work immediately floored me. You're definitely one of my favorite scrappers! Hi!! I just found you on Instagram because of violeta scrap and the course you're gonna do on march here in Madrid. I love the German one, the cassette and the floral one. Just know your amazing and trying to do similar things as yours, keep going in the same way because you inspire a lot of people. I first feel in love with your scrapbook designs at Twopeas and I have been following you on Instagram, I love your beautiful travel photos. I have never seen books like yours...they are delicious. I love the coaster book, the whimsy open knob book and the fabric floral. My father and two uncles all served in the Army in Germany, I like to show your Instagram photos to my dad. I'm kinda blown away by the whole 2000th post thing. I strive for that kind of consistency. Whitewashed wood, coaster, and rounded, in that order. Hi! Beautiful books! My three faves are the Plexiglass Sassafrass, the Whitewashed wood, and the Vintage German Charm book. I just discovered your blog via Pinterest, and I am very impressed...I've tried my hand at bookmaking with really horrible results but love and admire the craft and think yours look so beautiful and well-made! I look forward to checking back on your blog in the future! 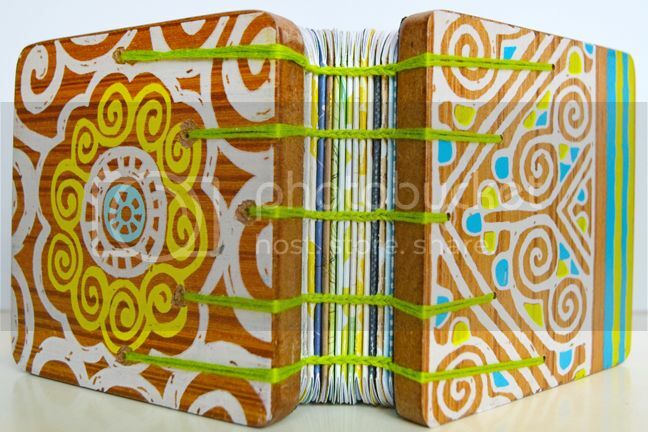 I love the wood book with the open knob, the sassafras book and the coaster book! I originally found you through 2peas. Congratulations on your 2000th post and keep up the creativity! You have an amazing talent. HI I'm french.I am 16,and a great fan of your art skills that I consider as masterpieces ! The number 10, 8 and 6. I have knew you 2 years ago. At this time I enjoyed to scapbook with my friend besides my mom offer me the "esprit scrapbooking" magazine for my birthday (14). There was an interview of you in it. My mom is actually an artist too because she has made hundreds of wonderfull patchworks that inspire me. I think sometimes that my life is pretty much as yours ! I would love to win any of them but 1, 4, or 6 is what I would choose or the really cool wood one too. I meet you through my Facebook shop. And my niece babysits for you. My fingers are crossed I win. Congratulations on reaching your 2000 post. I started following your blog via 2Peas and have been following your posts since your move to Germany closely as you blog about your discoveries in Germany and Europe. My favourite books are 5 Vintage German Charm book, 7 the little black book, and 10 the Flexiglass sassafras book. Thanks Paige - long may you keep blogging! Although they are all beautiful and you do such a wonderful job on them! I would love love love to be an owner of one of these magnificent books. And I only know you through your blog, you are my most favourite scrapbooker and I now stalk you through Instagram and Facebook as well. I always feel so inspired after reading your beautiful blog posts! Thanks so much for the opportunity! Merry Christmas to you and your family. Thank U for this opportinity. Amazing giweaway. I read your blog and following you by Instagram. your layouts are the ones with the WOW effect, so i felt in love with them and started following you! you´re so talented and i really love to look at your pages over and over again! sending BIG hugs and lots of love your way... happy sunday! 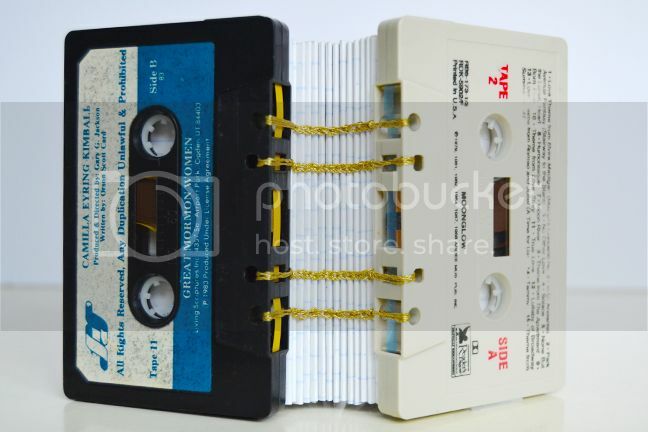 i have to give a shout out to your cassette tape book too because it's so fun & creative! love it! I know you from our days in the South Pas Ward, but didn't realize how crazy talented you are until we both moved away & i started following your adventures on your instagram/blog. I'm amazed at all your creativity. Congrats on all your success Paige! Hi! First, congrats on your blog. I came across your work on instagram. I love your travel photos. I have always admired creative people. I'm also a big fan of diys. Every piece of work is unique and tells a different story and I love that. It is so hard to choose from your books because they are all amazing. My top three faves are 1. Rounded Book I love its simplicity. 2. Floral Fabric book I am a big fan of anything with flowers. and 3. Plexiglass I love it. . I would definitely love to have one of your awesome books so thank you for this chance. More power on your blog. Cheers! All your books are gorgeous but my favorite three are: Open, White Washed Wood and Sassafrass! These are amazing. My three favorite are the anthro coasters, the knob book, and the white washed book. The cassette tape book is awesome too. Beautiful books! My favorites are the anthro coasters, the floral fabric, and the wood ones. Your books are absolutely beautiful. So are your pictures from Germany. I miss my time there. I was stationed at Rhein Main. I know it is closed now and probably any evidence of the base is gone now. Thanks for sharing your experiences. My favorite is the Sassafras book because it's got those lovely vintage papers inside! I imagine all those decorative edges would make any photos placed inside look quite handsome. I guess most of us have let you know how much we love that wooden know book! My daughter's nickname is Rainbow and this would be a perfect smash book replacement for her. It's awesome to think of her adding art and memorabilia to her own special collecting spot, and she loves to read too so I may have to borrow your idea and refinish as few of her we'll loved (is destroyed the same as distressed?) favorites. The way you attack with scraps always intrigued me when you were showcased with TwoPeas. I follow you on Instagram now and love hopping to your blog. You have a great mix of craft and real life stories here, it's obvious you enjoy the writing process! Cheers to your dedication and this incredible offering of handmade treasures! Hi Paige. Thanks for fab giveaway. Love the cassette, German and floral books. I first "met" you when I started scrapbooking just under a year ago and your stuff just overwhelmed me and slightly scared me as a newbie! Now I love reading the blog and following you on Instagram and Pinterest and occasionally lifting your awesome ideas!! As a new mum myself I also love reading about your little ones and when recently in the US you popped into my head my buying a t shirt with little foxes on it! The crazy world of social media! Wood open, whitewashed wood, anthro coaster. These are all stunning! I found you from studio calico, fell in love with your cut files and insanely talented work. Also an Instagram friemd, kat78, took a class with you live...so jealous! Follow you on insta and drool over each page you create. You are so talented! I've always loved these books. My favsies: Anthro coaster book, German book, whitewashed wood. Oh Paige - these are beautiful! I first 'met' you when submitting to Scrapbook Trends and quickly fell in love with your gorgeous scrappy style! I love these 3 books the most, but would be blessed to have any of them. Keep on Bloggin!!! I really, really love Sassafras and so my favorite book is the Plexiglas Sassafras Book. On the second place is the Anthro Coaster Book and the Whitewashed Wood Book. Oh I'd absolutely love any of them! My favorites are the whitewashed book, the anthro coasters book and the floral one! I actually found your blog on your 1000th post giveaway. The books you made were amazing, and then I saw you were a scrapbooker too! So I've been reading ever since. 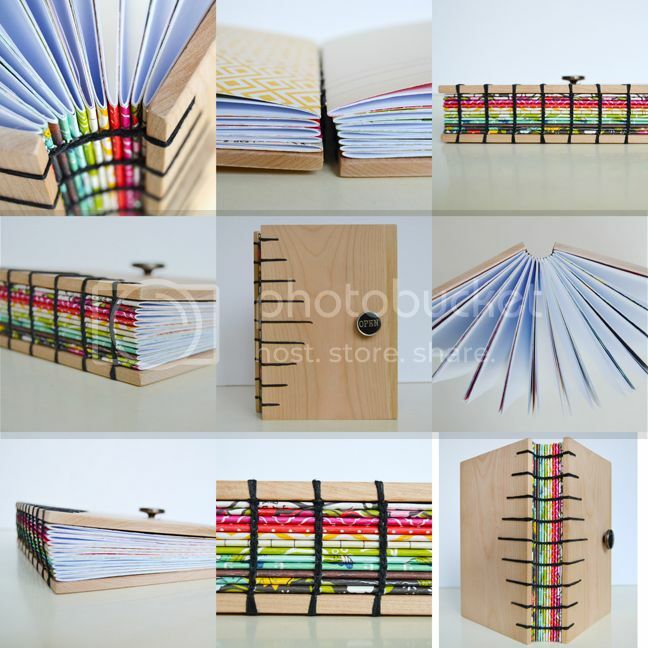 I love to bind my traveljournals and your books are looking so very lovely. It would be awesome to win one so I can take it on to my trip to italy next year. The wooden books are my favorite and love the sassafras one too. I follow your work at several scrapbook sites and on instagram. I would love to win a book, these are beautiful. Favourites are anthro, floral, and German. I started following you from American Crafts. My choice for top 3 of your books are: The Wood Book with Open Knob, The Rounded Book, and the Whitewashed Wood Book. I love your handmade books. What an incredible gift (x10!) you are giving away. Thank you for the chance to win one. WOW! All of these books are so beautiful! My top 3 choices are the Vintage German, Plexiglass Sassafras and then rounded book. Congratulations Paige on your 2000th post! What an inspiring accomplishment. I would be honored and it would be such a blessing to have the opportunity to win one of your INCREDIBLE works of homemade art! I have followed your blog for years and first came across your awe-inspiring work via American Crafts. I truly enjoy your layouts, your travels and your story-filled adventures with your family and friends. Your homemade books are AMAZING! Again, thank you for sharing and inspiring with all your works of art and life's journey through your blog. My favorites are your Whitewashed Wood book, Wood woth open knob book, and the rounded book. Any of them would be a treasure to have. I discovered you on Instagram. They are all so beautiful but I do love the German vintage, the wood with the open knob and the white washed wood book. You're amazing! 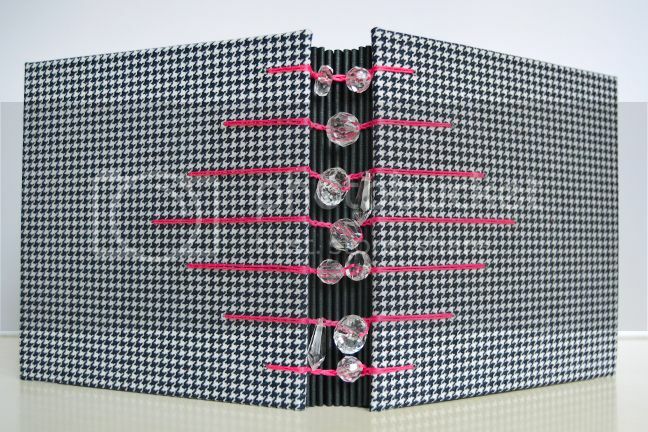 I am just a blog stalker and I took a book binding class from you.